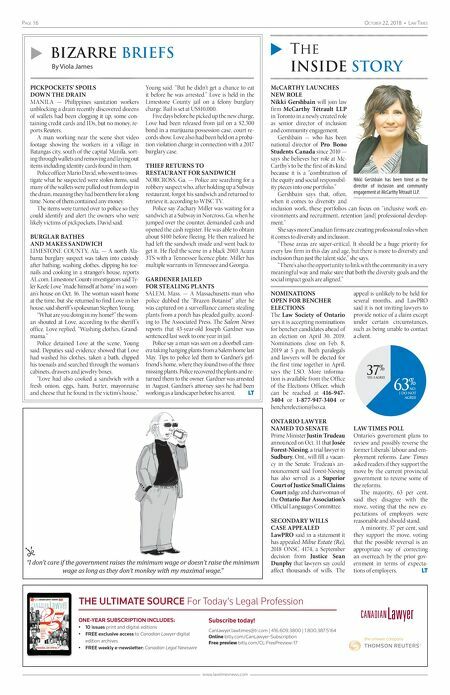 Page 16 OctOber 22, 2018 • Law times www.lawtimesnews.com u Bizarre Briefs By Viola James u The InsIde story "I don't care if the government raises the minimum wage or doesn't raise the minimum wage as long as they don't monkey with my maximal wage." PICKPOCKETS' SPOILS DOWN THE DRAIN MANILA — Philippines sanitation workers unblocking a drain recently discovered dozens of wallets had been clogging it up, some con- taining credit cards and IDs, but no money, re- ports Reuters. A man working near the scene shot video footage showing the workers in a village in Batangas city, south of the capital Manila, sort- ing through wallets and removing and laying out items including identity cards found in them. Police officer Mario David, who went to inves- tigate what he suspected were stolen items, said many of the wallets were pulled out from deep in the drain, meaning they had been there for a long time. None of them contained any money. The items were turned over to police so they could identify and alert the owners who were likely victims of pickpockets, David said. BURGLAR BATHES AND MAKES SANDWICH LIMESTONE COUNTY, Ala. — A north Ala- bama burglary suspect was taken into custody after bathing, washing clothes, clipping his toe- nails and cooking in a stranger's house, reports AL.com. Limestone County investigators said Ty- ler Keefe Love "made himself at home" in a wom- an's house on Oct. 16. The woman wasn't home at the time, but she returned to find Love in her house, said sheriff 's spokesman Stephen Young. "What are you doing in my home?" the wom- an shouted at Love, according to the sheriff 's office. Love replied, "Washing clothes, Grand- mama." Police detained Love at the scene, Young said. Deputies said evidence showed that Love had washed his clothes, taken a bath, clipped his toenails and searched through the woman's cabinets, drawers and jewelry boxes. "Love had also cooked a sandwich with a fresh onion, eggs, ham, butter, mayonnaise and cheese that he found in the victim's house," Young said. "But he didn't get a chance to eat it before he was arrested." Love is held in the Limestone County jail on a felony burglary charge. Bail is set at US$10,000. Five days before he picked up the new charge, Love had been released from jail on a $2,500 bond in a marijuana possession case, court re- cords show. Love also had been held on a proba- tion violation charge in connection with a 2017 burglary case. THIEF RETURNS TO RESTAURANT FOR SANDWICH NORCROSS, Ga. — Police are searching for a robbery suspect who, after holding up a Subway restaurant, forgot his sandwich and returned to retrieve it, according to WISC TV. Police say Zachary Miller was waiting for a sandwich at a Subway in Norcross, Ga. when he jumped over the counter, demanded cash and opened the cash register. He was able to obtain about $100 before f leeing. He then realized he had left the sandwich inside and went back to get it. He f led the scene in a black 2003 Acura 3TS with a Tennessee licence plate. Miller has multiple warrants in Tennessee and Georgia. GARDENER JAILED FOR STEALING PLANTS SALEM, Mass. — A Massachusetts man who police dubbed the "Brazen Botanist" after he was captured on a surveillance camera stealing plants from a porch has pleaded guilty, accord- ing to The Associated Press. The Salem News reports that 43-year-old Joseph Gardner was sentenced last week to one year in jail. Police say a man was seen on a doorbell cam- era taking hanging plants from a Salem home last May. Tips to police led them to Gardner's girl- friend's home, where they found two of the three missing plants. Police recovered the plants and re- turned them to the owner. Gardner was arrested in August. Gardner's attorney says he had been working as a landscaper before his arrest. LT McCARTHY LAUNCHES NEW ROLE Nikki Gershbain will join law firm McCarthy Tétrault LLP in Toronto in a newly created role as senior director of inclusion and community engagement. Gershbain — who has been national director of Pro Bono Students Canada since 2010 — says she believes her role at Mc- Carthy's to be the first of its kind because it is a "combination of the equity and social responsibil- ity pieces into one portfolio." Gershbain says that, often, when it comes to diversity and inclusion work, these portfolios can focus on "inclusive work en- vironments and recruitment, retention [and] professional develop- ment." She says more Canadian firms are creating professional roles when it comes to diversity and inclusion. "Those areas are super-critical. It should be a huge priority for every law firm in this day and age, but there is more to diversity and inclusion than just the talent side," she says. "There's also the opportunity to link with the community in a very meaningful way and make sure that both the diversity goals and the social impact goals are aligned." NOMINATIONS OPEN FOR BENCHER ELECTIONS The Law Society of Ontario says it is accepting nominations for bencher candidates ahead of an election on April 30, 2019. Nominations close on Feb. 8, 2019 at 5 p.m. Both paralegals and lawyers will be elected for the first time together in April, says the LSO. More informa- tion is available from the Office of the Elections Officer, which can be reached at 416-947- 3404 or 1-877-947-3404 or bencherelection@lso.ca. ONTARIO LAWYER NAMED TO SENATE Prime Minister Justin Trudeau announced on Oct. 11 that Josée Forest-Niesing, a trial lawyer in Sudbury, Ont., will fill a vacan- cy in the Senate. Trudeau's an- nouncement said Forest-Niesing has also served as a Superior Court of Justice Small Claims Court judge and chairwoman of the Ontario Bar Association's Official Languages Committee. SECONDARY WILLS CASE APPEALED LawPRO said in a statement it has appealed Milne Estate (Re), 2018 ONSC 4174, a September decision from Justice Sean Dunphy that lawyers say could affect thousands of wills. The appeal is unlikely to be held for several months, and LawPRO said it is not inviting lawyers to provide notice of a claim except under certain circumstances, such as being unable to contact a client. YES, I AGREE 37 % 63 % NO, I DO NOT AGREE LAW TIMES POLL Ontario's government plans to review and possibly reverse the former Liberals' labour and em- ployment reforms. Law Times asked readers if they support the move by the current provincial government to reverse some of the reforms. The majority, 63 per cent, said they disagree with the move, voting that the new ex- pectations of employers were reasonable and should stand. A minority, 37 per cent, said they support the move, voting that the possible reversal is an appropriate way of correcting an overreach by the prior gov- ernment in terms of expecta- tions of employers. LT THE ULTIMATE SOURCE For Today's Legal Profession Canlawyer.lawtimes@tr.com | 416.609.3800 | 1.800.387.5164 Online bitly.com/CanLawyer-Subscription Free preview bitly.com/CL-FreePreview-17 Subscribe today! ONE-YEAR SUBSCRIPTION INCLUDES: • 10 issues print and digital editions • FREE exclusive access to Canadian Lawyer digital edition archives • FREE weekly e-newsletter: Canadian Legal Newswire THE TOP MOST INFLUENTIAL $ 1 1 . 9 5 A u g u s t 2 0 1 8 MAKING AN IMPACT MEET THE CANADIAN LAWYERS AND JUDGES WHO ARE SPECIAL SECTION: CANADIAN LAWYER 4STUDENTS P.51 CHANGEMAKERS HUMAN RIGHTS, ADVOCACY AND CRIMINAL CORPORATE COMMERCIAL YOUNG INFLUENCERS GOVERNMENT/ NON-PROFITS/ ASSOCIATIONS M PM AGREEMENT # 40766500 Untitled-3 1 2018-10-16 12:54 PM Nikki Gershbain has been hired as the director of inclusion and community engagement at McCarthy Tétrault LLP.